As I mentioned last week, I’m hosting an event at Nordstrom at the Houston Galleria on Saturday, October 19th to promote the launch of Topshop in stores! In addition to styling myself and five mannequins for the event, I was also able to select several additional pieces to help complete my fall wardrobe. This quilted (faux) leather skirt was a no brainer for me. I’m so eager to wear my quilted leather pants but the weather here just isn’t suitable for that quite yet. It’s an easy piece that goes with everything, but the quilted look and zipper detail make it that much cooler. The other item I scooped up was this pair of killer black + gold sandals. The chunky heel makes them sturdy (no more wobbly legs, not to mention they are SO comfortable) and the gold plate is the epitome of cool. Did I mention both pieces are under $100? Such a steal. To “top” off this made-for-fall look, I chose my newest Equipment acquisition, the Liam. This is my first non-button up Equipment and I love it! The contrast leopard sleeves are to. die. for. I hope my Houston ladies (and gents are welcome too) will stop by between 1-4pm on Saturday to shop with me and check out the amazing fall collection from Topshop! Love that this quilted skirt is a bit more flared and dying for this top right now. So cute. 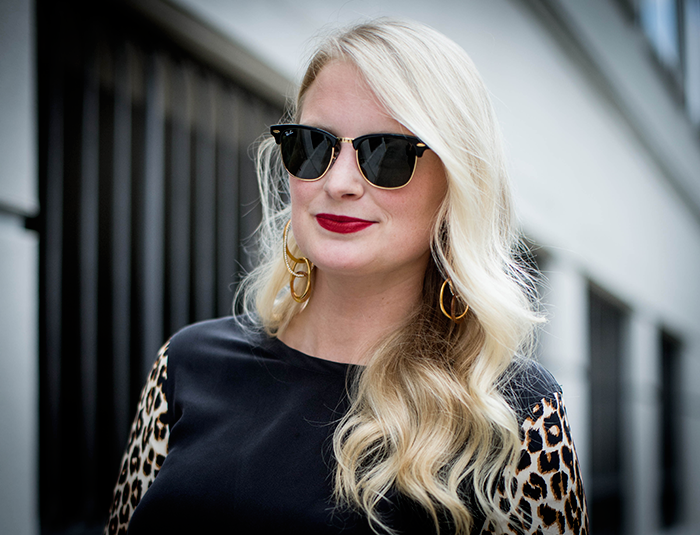 Love this skirt on you and loving how you paired it back to leopard! love this blouse! I have the similar version with the floral + cheetah. the black is much more practical, but love both! STUNNING! If I just hadn’t bought a pair of black and gold heels I would so buy these! I pretty much need every single one of the pieces you’re wearing here. The quilted skirt is just perfect! Love everything about this! These pieces look fantastic together, but they’re all so versatile that you’ll definitely wear them with other things too. Great picks! This skirt! The entire look is so good but these topshop pieces are really calling my name. I haven’t shopped there in a while but am clearly about to click thru! I love the leopard on the top-it gives it a little something unexpected & fun! Love the skirt…and the price it perfect. I hope to say Hello, while your in Houston. Girl, apparently I can’t spell today. While you’re in Houston. you should DEFINITELY come by the event at Nordstrom – would love to hang out! Love the quilting on the skirt – its such a fun addition and makes the piece just enough different from most other leather skirts this season. And zipper details are always a good thing in my book! These are my favorite outfit photos of you EVER!!! Obsessed!!! LOVING that equipment blouse. I almost snagged it during their frineds and family sale but I just couldn’t get myself to do it. But the Saks one is going on now… so I may have to! That look is gorgeous on you! Oh lala, this is perfect and you look stunning. That quilted skirt paired with the leopard print is perfection. The gold details finishes the look. That quilted skirt is so cute! Topshop is killin’ it these days! 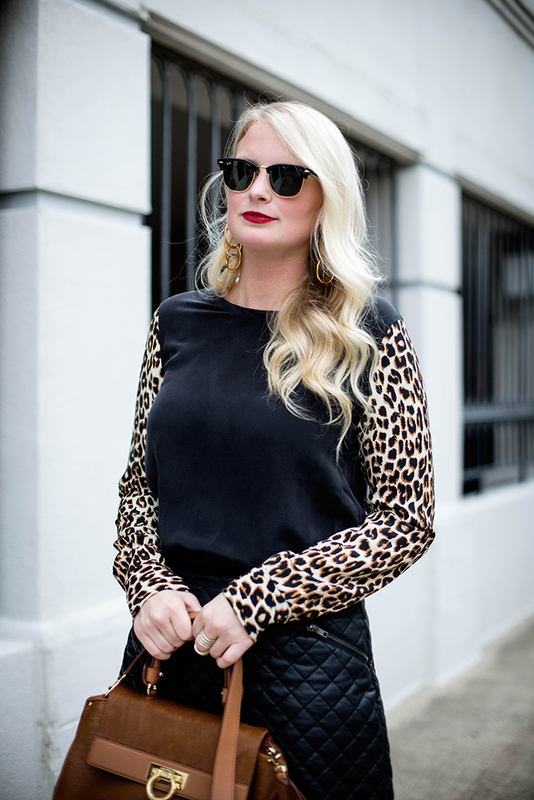 I love the way you paired the sweater with the leopard sleeve detail with the skirt for an edgy super chic look! Happy Monday! Love this look! Those Ray-Bans are awesome! Ahhh! I LOVE this outfit. 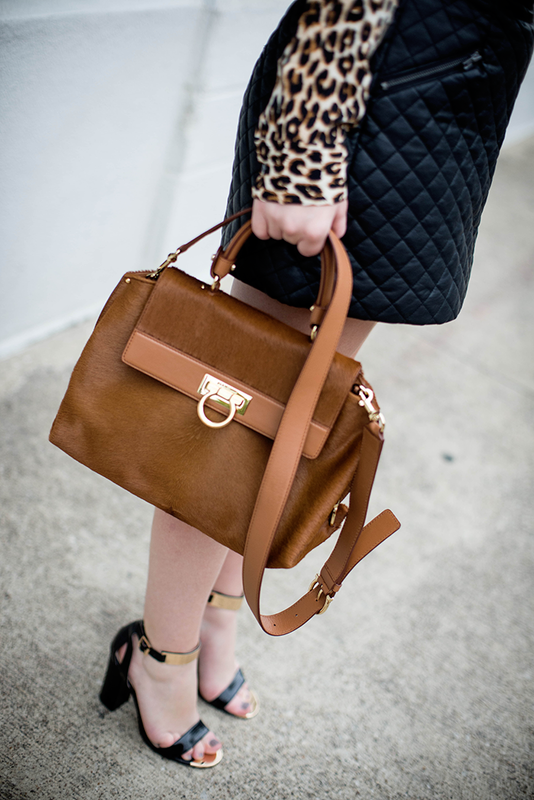 From the leopard print sleeves to the adorable bag and the quilted skirt, you look phenomenal, girl! So beautiful, Merritt! Good luck with the event on Saturday! You’re right, those leopard sleeves are to die for! I love the quilted skirt too. Hope you have a great time at your event! this whole outfit is insane– love it! You look great.. Love the skirt! That skirt looks fabulous on you! Love how you paired it with the animal print.